Some very interesting developments have taken place over the last two weeks. One of these is the fall of the Syrian Regime´s Brigade 82 base in the southern province of Deraa to a mixed force of FSA (Free Syrian Army) and JN (Jabhat al-Nusra), over the period 25-26 January. This was home to the principal Regime SAM site in southern Syria, as well as a key component of ground defence of the approaches to Damascus and the Damascus - Deraa - Jordan border highway (M5), as well as the Deraa - Jordan Route 5, see maps. This has several key implications for events in Syria. 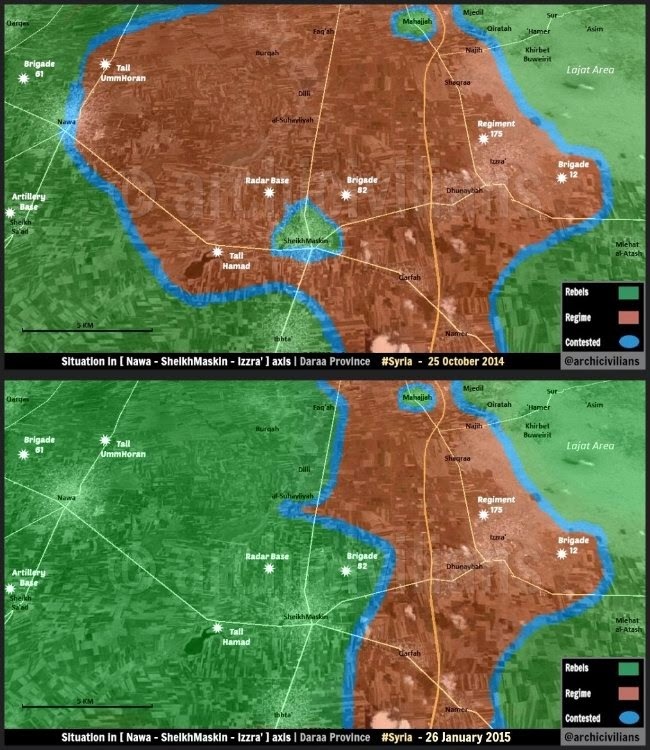 Firstly, the Regime had to “fire brigade” scarce units from other fronts to shore up the defence of approaches to the capital and to maintain the crucial road arteries to Deraa town and the Jordanian border. This will force the Regime to juggle priorities on the varied fronts on which it is engaged and has the possibility to negatively affect its on-going attempts to encircle Aleppo city in the northeast; already, Rebel forces have been trying to pinch-off the Regime salient jutting into Rebel territory that constitutes the northern wing of Regime attempt to encircle the beleaguered Rebel-held zone of Aleppo. One would have expected JN (AQ´s affiliate in Syria), the FSA and others to exploit this significant military and psychological set-back for Regime forces, but efforts have been hampered by Rebel in-fighting and the Regime´s strategic "dividend” of the Kobani Kurd YPG´s recent enlargement of the Kobani pocket that now threatens the northern Line of Communication between IS territory in north-eastern Syria and the IS western front in Aleppo province. The Regime has also been able to concentrate its tactical airpower in Aleppo, Idlib and other fronts due to the on-going US and allied airstrikes against IS elsewhere in Syria. Secondly, the Regime´s ability to protect its airspace from Israeli air-strikes is now seriously compromised - a worrying development for the Regime leadership in view of both its WMD holdings - alleged nuclear program - and transfer of missiles and rockets to Lebanese Hezbollah. The recent Israeli air-strike on 18 January, which targeted senior Hezbollah and Iranian Revolutionary Guard Corps Qods Force (IRGC-QF) officers inside Syria, was the precursor to follow-on strikes against Regime/Hezbollah/IRGC-QF (Axis) targets inside Syria following the Hezbollah attack on an Israeli convoy in the Golan. Thus far, Israel had refrained from direct overt intervention in the civil war in Syria - restricting itself to attacks on Hezbollah weapons convoys - but with less SAM cover available to the Regime - the Israelis could be further tempted to take out Axis targets of opportunity, especially if provoked. The SAMs pictured on social media are the SA6 Gainful, the SAM system that accounted for so many Israeli aircraft in the 1973 War and which allows the user to deploy a robust, all-weather, all-target system close to the Forward Edge of the Battle Area. The Israeli Defense Forces command are unlikely to want to allow such systems with a max range of 60km and max altitude of 18km to remain in rebel/radical Islamist hands. (See tech specs link above). It is logical that the Israelis would therefore want to destroy these systems. ft, but principally to civil airliners. This opens the possibility to likely Israeli air strikes against those systems and the consequent possibility for escalation with Axis forces that Israeli warplanes over Syria could entail, especially against the backdrop of increased tensions between Israel and the Axis (see INSS article link above). Another issue for the Regime is the ability of Iran (and others) to fly in reinforcements, scientific personnel and ordnance (if the Americans are allowing them to) and also to ferry Regime, IRGC-QF and Hezbollah units around the various isolated Regime posts. Without adequate SAM cover, the Israelis could be tempted to take out Regime and Iranian transport aircraft in certain situations - such as during the movement of senior Axis commanders. This will be a situation to watch. Additionally, JN/FSA could well use the SAMs against Regime or Iranian aircraft. A gut feeling is that JN (if they are in control of the SAMs) would trade-away a tactical success against a regime aircraft for a much bigger propaganda coup of shooting down an airliner or larger Israeli aircraft such as an EW, ELINT, SIGINT or battlefield surveillance platform. Thinking logically, an Israeli or other airliner would be the best possible target for JN, assuming the SA6's are serviceable and JN has the personnel and resources to operate them successfully. It is however, much easier to shoot down an airliner than an Israeli war-bird, which is way more manoeuvrable, has a trained tactical pilot, jamming pods, countermeasures suite and the benefits of airborne warning and control and battlefield surveillance systems, both airborne and on the Golan Heights in a “look-down” position. The Israelis have also had years of practice in countering the SA6, although fired in multiple salvos, it still represents a threat to pilots. Firing on an Israeli war-bird is also going to result in a very fast turnaround for a Suppression of Enemy Air Defences (SEAD) mission. An airliner also carries a lot more potential victims for propaganda and psychological purposes. A Syrian MIG is easier to shoot down than an Israeli war-bird, especially with likely AAA added to the equation. However, a MIG is still highly manoeuvrable and Syrian ground-pounder pilots are likely pretty switched-on to the tactical situation by now. A MIG loss also doesn't have the kudos of killing large quantities of Israelis or other unbelievers. A Syrian helo is vulnerable being slow, as is a transport aircraft. However, both lack the kudos of an airliner kill. Also, we don't know how many spare missiles are available; one would assume a significant quantity given the key role the base played in the Regime´s air defence network. The JN/FSA will be aware that without the launch vehicles and radars, the missiles are useless unless for cannibalization of the warhead and other components. Therefore, they will want to get the three missiles off the launch rails from each launcher at near "dead-cert" target or targets, in the expectation that a SEAD mission will shortly ruin everyone´s day and turn the kit into junk. JN would also likely want to shoot down a US aircraft, but this would necessitate movement of the SAM systems form their current location with all the tactical and mechanical risks that would entail. It is far easier to move the systems a relatively short distance from where they were captured. A US warplane also entails the same level of difficulty as shooting down an Israeli one. If the FSA (as a pose to JN) has control of the SAMs, then calculations will probably be different. The FSA won't want to upset the Israelis (or Americans) at this point and would most likely want to use the SAMs tactically against Regime and Iranian aircraft. 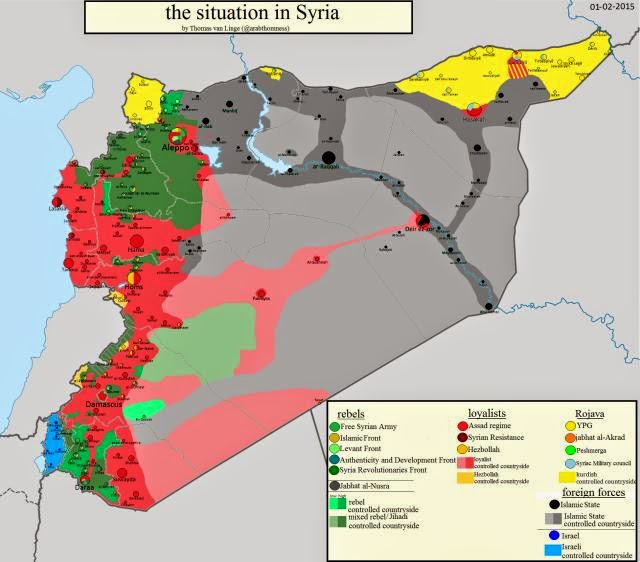 The SAMs would stand a much better chance of survivability against Regime SEAD missions, could alter the tactical air situation in the FSA's favour at a given point in time and space (for example in support of an offensive) and would generate gratitude / psychological / propaganda benefits from a civilian population upon their seeing hated Regime aircraft downed. The FSA might try to leverage the kit to the Americans - for the chance of examining any upgrades to radars or missiles - in return for anti-tank guided weapon systems and other kit / money / training / targeting intel from the Americans. They may be out of luck here however, as the Americans have had many opportunities over the years to study the SA6 first-hand and in detail. The key takeaway from all the above, is that there are likely to be a lot of worried people currently studying this problem and preparing to mitigate the risks that this SAM-in-rebel-hands threat presents.